- Soak the bread in water, then squeeze dry. 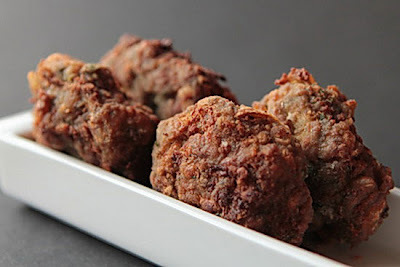 - Thoroughly mix the meat with the ground garlic, onion, bread, dill/parsley, egg, and spices. - Pick enough composition to fill an empty egg shell. Form a sphere, then flatten it lightly. - Roll each of them in flour, then fry till ready. - Present the chiftelute on a bread of chopped onions or with hummus. - Tomato slices and parsley can always add a splash of color to the presentation.